Humility. hu-mil-i-ty. (hyoo-mil-i-tee). Noun. The quality or condition of being humble; modest opinion or estimate of one’s own importance, rank, etc. When I think of the values I want to instill in my children, humility ranks near the top of the list. 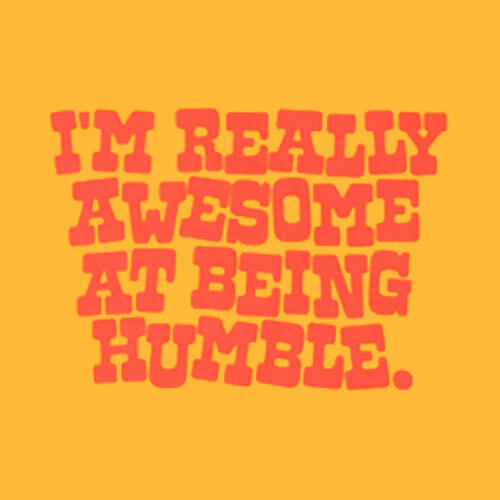 There are two people in my life who come to mind when I think of humility, or in their case, a lack thereof. Both of these people talk more than listen, brag more than compliment, and gloat more than praise. Their arrogance and showmanship is distasteful, off-putting, and often times insulting. But as I thought about it, I realized they’re patting themselves on the back because they’re worried no one else will. Insecurity and lack of humility go hand in hand. If a person is not secure with themselves, they have to broadcast their accomplishments for all to hear, in the hopes that they’ll feel better about themselves. This is where my parenting mission starts. To instill humility, I must instill confidence. To instill humility, I must instill pride. To instill humility, I must instill self esteem. “Do you wish to be great? Then begin by being. So let’s go build foundations for our kids. Deep ones. So that they may be accomplished and humble. This entry was posted in Opinion, Parenthood and tagged humility, parenting, values. Bookmark the permalink. Thanks Mom! Jeez, the things I didn’t think of until becoming a parent! Glad it gave you some food for thought Lisa!